"Only Anglo-Saxon kings wore helmets and this is one of a very small number ever to be found." The BBC attribute the quote to a Dr Ellen McAdam from the Birmingham trust. Do we have any understanding of the cultural reasons that led to a universal abandonment of head protection? With all due respect to Dr McAdam, I don't think that is correct. 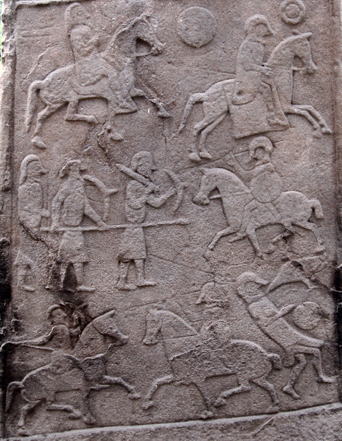 This particular stone is often referred to as Aberlemno II, and the battle scene depicted is generally accepted to be that of the Battle of Nechtansmere in 685. It seems unlikely that all Anglo Saxon cavalry were kings! ... flourished in England and Scandinavia from the sixth through to the eleventh centuries. The Coppergate helmet is now on display in the collection of the Yorkshire Museum. The Staffordshire Helmet is of the same type as the Coppergate Helmet, but is much more richly decorated. I suspect that Dr McAdam may have mis-spoken (or, perhaps more likely, been misquoted in the article), and that she perhaps meant that only Anglo-Saxon kings would have worn such richly decorated helmets as the ones found in the Staffordshire hoard, and at Sutton Hoo. People may also find the Twitter broadcast discussing the Staffordshire Helmet by Dr Janina Ramirez on 23 November 2018 from the Birmingham Museum and Art Gallery of interest. (She does not repeat the claim). This is not true, certainly for the later period and probably for the earlier period too. Covering the early period (and bearing in mind that it is heroic fiction), we have references in Beowulf to the 'grimhelmas' worn by the warriors of Beowulf's company on arrival at Heorot (line 334) and before the fight with Grendel (line 1245); none of whom were kings. While this isn't really strong evidence that helmets were worn regularly by warriors, it is a strong indication that there was no cultural reason stopping them from doing so. Later, in the 11th century, we have good written evidence of helmet wearing in an edict from 1008 that requires every eight hides of land to provide a helmet and mail coat, written account of a gift from Earl Godwine to Harthacanute of a ship manned by eighty warriors 'of whom each one had on each arm a golden arm-ring weighing sixteen ounces, a triple corselet, on the head a helmet in part overlaid with gold;', and of course the Bayeux Tapestry, which depicts the majority of the Anglo-Saxon warriors wearing helmets. While there doesn't seem to be any real evidence that only kings wore helmets in this period, what we do have is a paucity of evidence of helmet wearing, and of the six relatively complete Anglo-Saxon helmets we do have, two are almost certainly of kingly origin (the Staffordshire hoard helm and the Sutton Hoo helm), and the others are from high-status graves (of note is the fact that the Coppergate helm is inscribed with the name 'Oshere', which is almost certainly not the name of a king). 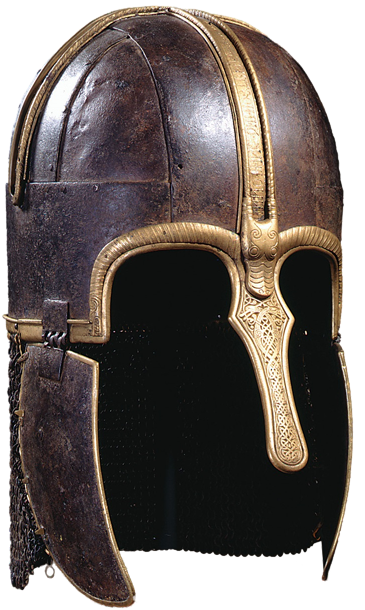 It's probably true that in the earlier Anglo-Saxon period few people apart from kings could afford helmets, this doesn't imply that helmet wearing was ever restricted solely to kings. Not the answer you're looking for? Browse other questions tagged military england armour anglo-saxons or ask your own question. Why did helmets have this metal thing between the eyes? Did medieval guards wear heavy armor for long periods of time? Why did the people of Nantwich (Cheshire) wear holly to celebrate Parliament's victory there during the English Civil War? What did cataphract units wear under the armour?